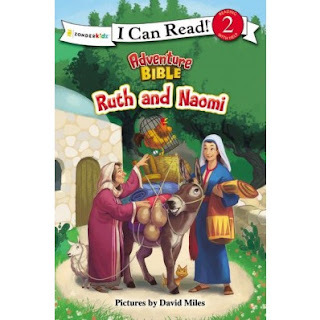 Book Review: "Ruth and Naomi"
In this retelling of the Old Testament story of Ruth and Naomi, young readers learn about the loving kindness of people for one another and the loving influence of God in their lives. When Ruth decides to follow her mother-in-law to a strange land, after the death of her husband, she proves her dedication to family and God. Written in the I Can Read level 2, this story shows how love and honor are rewarded by God with great gifts, like Ruth meeting Boaz and being part of establishing the line of King David. Perfect for beginning readers ages 4-8, learning Bible stories on their own. Thank-you Zondervan for sending me this book in exchange for an honest review. I was not paid for this review and all opinions are 100% mine. I love this tender story of honor from Ruth and Naomi. I love teaching my kids the importance of loving family and being dedicated to each other. I love to teach my kids how to encourage and build each other up and I feel that this story can help teach dedication and encouragement. My daughter is getting very good at reading so these "I Can Read" books are a super fast read for her now. She still enjoys them and I enjoy the discussions after.